NAIROBI, Kenya (CNN) -- A plane crashed Tuesday in western Kenya, killing all four people on board, including a Cabinet minister and an assistant minister, President Mwai Kibaki said. The two senior government figures were members of Raila Odinga's party. "The wreckage has been found and there are no survivors," Kibaki said, according to the government Web site. Kenyan Roads Minister Kipkalya Kones and Assistant Minister of Home Affairs Lorna Laboso had been on board the Cessna 210, which was headed to Kericho, in the Rift Valley. The plane crashed in a remote area called Kajong'a, in western Kenya, Kibaki said. The president identified the two others killed as Kenneth Kiprono Bett, who worked for Kones, and the pilot. "Our country has lost leaders of immense potential at their prime age and with a promising future," Kibaki said. "Let us all remain united at this moment of sorrow as a nation." Salim Lone, a government spokesman, told CNN earlier that the plane crashed about an hour after it took off from Nairobi's Wilson Airport around 2:18 p.m. local time (7:18 a.m. ET). "This is terrible, and utterly unimaginable news for us in Kenya, where there has been so much suffering recently," Lone said. He did not know what caused the crash, but said, "There is absolutely no hint of foul play. It looks like a terrible tragedy." Both Kones and Laboso belonged to the Orange Democratic Movement party (ODM), which joined Kibaki's Party of National Unity (PNU) in a coalition government earlier this year under an United Nations-brokered agreement that brought an end to the violence that ripped the nation after Kibaki's disputed re-election in late December. More than 1,000 people were killed and 350,000 were displaced in the violence, according to the Kenyan Red Cross. 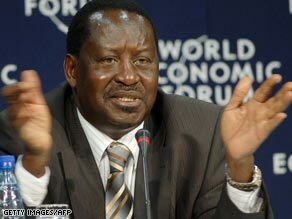 Under the agreement, Kibaki retained the presidency while ODM leader Raila Odinga became prime minister. A new cabinet took office in April, with equal representation from both ODM and PNU. The officials' deaths came a day before parliamentary by-elections in five districts in Kenya.